(a) When shifting the shift lever to each position, make sure that it moves smoothly, can be moderately operated and the position indicator displays correctly. (b) When starting the engine, make sure that the vehicle moves forward when shifting from N to D position, and moves backward when shifting to R position. (a) Loosen the nut on the control shaft lever. (b) Push the control shaft fully downward. (c) Return the control shaft lever 2 notches to N position. 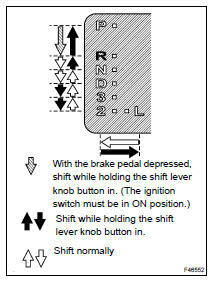 (d) Set the shift lever to N position. (e) While holding the shift lever lightly toward the R position side, tighten the shift lever nut. (f) Start the engine and make sure that the vehicle moves forward when shifting the lever from the N to D position and moves backward when shifting it to the R position.